You know you get those people in life that just want to do the right thing? I know quite a few of these 'jem-like' individuals, maybe it goes hand in hand with surfing, maybe the stoke makes us more grateful for the things around us. It is about one such individual and his passion that has turned into my passion that I would like to talk. Cameron Brown is one of the best humans I have ever met. What I mean is that I am not sure if he has a bad bone in his body. Well balanced, informed, educated and with one of the most highly tuned moral compasses… okay, okay enough.. you get the message. Last year Cameron knew that he wanted to give back to the community, the planet and the general well being of all those who use the ocean. 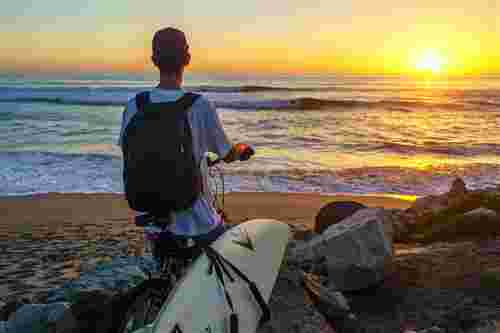 An idea was born, it was called Bike to Surf and since then it has snowballed, gathering speed, support and major sponsors in the surf industry and beyond. You can look uber cool and B2S. Enough of me rabbiting on, lets hear from the man himself, Cameron Brown. SB: Hey Cam, hows the surf been in El Segundo recently, have you been getting some decent ones? Cam: Hey James! Stoked to be e-chatting with you today. Meeting you and your family in France the year before last was just an absolute pleasure, and I can’t wait to get out to Portugal for a visit. Waves have been fun here at home. Lots of good sandbars at the moment. It’s been an interesting season with El Nino. Tons of swell, but not necessarily a ton of good shape. The photos you see going viral of pumping LA are mostly just pretty moments before chaotic close outs ensue. The smaller and medium sized days have been a lot of fun though. SB: What is the idea of bike to surf week? Cam: It’s an event I came up with to create awareness about the ability we have as individual surfers to lower our carbon emissions by driving less to the beach. On the hunt for waves, the easy way. SB: Do you remember when you first had the idea for B2S? Was there a 'lightbulb' moment? I had been reading about sustainability in the surfing industry and the powerlessness I felt to create real change there led me to look toward a place I felt like I did actually have power (my own life, my own decisions and actions). I’d seen on Surfline a story about a guy who simply gave up surfing for a year to see what it would be like, and he just blogged about it. I figured, that wasn’t for any kind of good cause at all, and Surfline thought it was interesting enough to post about. I was sure they’d want to post about this (they didn’t). So I made that statement, and after a little while came Surfrider Foundation’s World Water Day campaign, where they encouraged people to pledge to skip their shower on World Water Day. I thought that was really a cool campaign, and thought, maybe I could create a day for people to skip their drive to the beach and use alternative transportation instead. But with that, I felt people would need a week or so to choose a day to participate. Hence, Bike to Surf Week was born. SB: Has B2S gone as well as you expected? How much support has it received? Cam: Bike to Surf has exceeded my expectations. It’s only been a short time, but it’s taken me to places that I didn’t necessarily expect it to. For instance, getting to know executives of organizations like Surfrider Foundation and World Surf League, and receiving shout outs on Fox News in LA and local television stations. Our first event had participation from people in 7 different countries. People like the concept. SB: What can a surfer do on a daily basis to help the environment besides find alternative transport to the waves? Cam: Okay, let me just quickly go on a rant. First and foremost, surfers have to care, because if we who feel so deeply connected to precious resources such as the ocean don’t care, then who will? And if you’re thinking along the lines of ‘how can what I do make a difference?’ you’re not alone. Sadly you’re in the majority, but this way of thinking is incredibly flawed. Surfers are trend setters and they always have been. That’s why people in middle America wear brands like Quiksilver even though they’ve not surfed a day in their life. We are perceived as being cool. And I believe that perception can and should be used for good. So as a community together we can start to become more conscious of how we are living, and we can start to make adjustments to live lives that better reflect who we are and what we really care about. I won’t list off what we as individuals can do to live more eco-friendly lives, because a thousand of those lists have already been written. What I will do, is try to inspire people to care enough to go seek out these lists on their own, and start implementing change into their life. Because if they do, they’re parents may follow suit as mine have, as well as their aunts, their uncles, their neighbours and friends. This is the kind of chain reaction that can be seen by people who start to live smarter. Our actions together on a grand scale have the potential to make huge positive impacts on the world around us. That’s ultimately the idea I’m trying to get across through all of My Wave Addiction’s events and programs. Even with a mal and no rack. SB: Where and when is going to be the next Bike to surf week? Cam: The next Bike to Surf Week will be held from April 23rd to May 1st of 2016. People can participate anywhere in the world by choosing one day during the event window to use an alternative form of transport to get to the beach. We have some amazing sponsors in line to send out prizes to randomly selected participants for being apart of it. All event details can be found here . SB: What are your views on using more sustainable materials to construct surfboards and wetsuits? Cam: My views are that it’s important for us as surfers to support companies that make these things a priority. Promoting conscious consumption is massively important to My Wave Addiction’s overall mission. I want us as a community to think first of all, do I really need this new thing (whatever it may be), or do I just want it. And secondly, if I do need it, asking yourself where was it made and by who? What is it made of? We don’t have to be perfect consumers, but it’s important for us to start thinking in this way when making purchases. No worries trying to find a parking space. SB: Sure you meet and hear of organisations that want to help and protect the ocean and the environment surrounding the ocean, but very rarely do you meet someone with such passion and who is so level-headed about his ideas. It is a truly refreshing thing. Why not make a change, who knows you could actually enjoy it. Happiness is doing your bit.